This site remains here for legacy reasons and will not be updated! All the other articles are probably still available but not linked any more. Start page. In this tutorial I'll cover how you can help a person with computer problems (on a windows system, of course) via VNC, even if that user is behind a NAT router. One solution to this is to use the router's port forwarding ability (if that router even has such a function). But this is very complicated to set up, especially if you don't have access to the router yourself and have to guide a user through menus and forms you cannot see. But there is another way, called Reverse VNC. a "gateway", i.e. a computer which is not behind a NAT router and thus reachable from the outside. Typically, this could be a root server. In either of these cases, the user whose computer you want to control remotely has to install TightVNC (Direct Link to the Windows Binary Installer). Once the download is finished, VNC must be installed. After TightVNC was successfully installed, the user has to start a new server. That is done via Start -> All Programs -> TightVNC -> Launch TightVNC Server. If a configuration dialogue is shown, be sure to set a password (won't be used any more; pick something like 123). Click OK.
After that, you maybe have to re-start the server. You can see that the server is running properly if there pops up a V-Icon in your SysTray. So much for the Windows box. Set up proper port forwarding. You have to forward Port 5500/tcp to your computer. Setting up port forwarding heavily depends on how good/expensive your router was. Port forwarding usually takes some time and knowledge how to do it as well. And, port forward rules are static. After finishing the VNC session you'd have to delete the rule again. If you know how to do all that, skip the next few paragraphs. The gateway just reads packages from the windows machine and forwards it (over a secure channel) to your PC where you can then interact with the VNC session. Now, every connection made to gateway:5500 is forwarded over the secure channel to your host, port 5500. Just leave that program open. As it is in listening mode, it'll wait until a connection comes in and will then open the window for you automatically. Since the connection will be started from the host you want to control, you don't have to enter any kind of password. 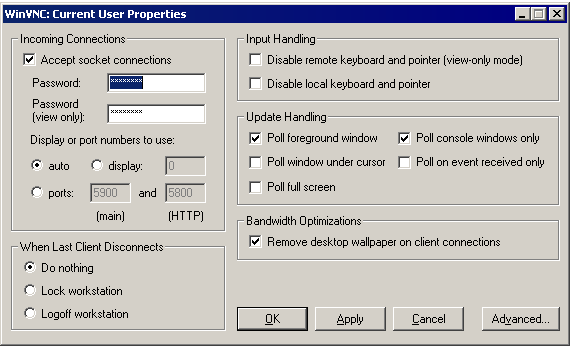 Now, the user can initiate the connection from his/her windows box by right-clicking on the VNC SysTray icon and selecting "Add New Client". As hostname just give the IP or hostname of your gateway (if you haven't set up a gateway but port forwarding at your router, insert your IP or perhaps DynDNS hostname). Then click OK.
Voila! The connection should be working now. Questions? Suggestions? Reviews? I love to receive email!